As I have had such great fortune to have learnt from amazing and unforgettable people internationally, it is my honor now in turn to share from my education, my experiences, my life and my heart. I am just like you, I have my dreams just like you. Many of them achieved, and many in manifestation. But always continuing to explore, expand, learn, grow, go deeper. It is my passion to share all that I have learnt, helping you on your path, bringing clarity to your dreams and develop your tools to manifest your heart’s desire. I have dedicated much of my time to play contemporary music. Always exploring new way of expression using the voice, breathe and movement. In New York I enjoyed creating dozens of workshops and interactive and multicultural concerts for kids through Lincoln Center and Midori & Friends Foundation in New York, and Euro Kids Festival in Washington DC. Music is my ticket to the world, connecting me with countries, cultures, traditions and most importantly to “my people,” who are everywhere. Music has also been the key to my human development and to my inner path. To be a complete artist – or a human being – we are called to continue to honor and to fulfill our true genius and soul in all aspects of our lives, because in the end music is a vibrational reflection of life itself. And we are all music. And Why Do I Live in Cusco? From my teens I had the dream to go to Machu Picchu, but when I first came to Peru in 2010, I realized that ot wasn’t only the beautiful sanctuary of Machu Picchu that was calling me. I felt that the inexplicable spirit of the Andes in general – its people, music, food, stories, mysticism – was the magnet that was calling my name. From that very first time in Cusco everything started to magically flow with profound connections in the heart space. I have travelled in many countries, but in Peru I feel at home, very connected with the Andes, confortable being so close to heavens, and on the other hand very connected with the ocean and the silence between the waves. With great joy and gratitude I offer classes of interpretation and artistic development. These classes are for all levels and for all instruments. In addition to the musical instruction, we topics include: Preparation, how to practice, how to memorizar, the nerves, the doubts, communication and the important tools for discipline and self-confidence. In these interactive classes we explore the possibilities to expand vision and imagination o be able to continue to grow and to change the world. One heart at a time, beginning with our own. Practical tools, energies and inspiration. Suomalainen huilutaiteilija Ulla Suokko nauttii hyvin monipuolisesta kansainvälisestä urasta ja hän on myös esiintynyt monilla maailman tärkeillä areenoilla. Hänen virallinen New Yorkin debyyttinsä oli Carnegie Hallissa hänen voitettuaan Artists International kilpailun. Ulla on soittanut konsertteja monissa Euroopan maissa, Yhdysvalloissa, Mongoliassa, Japanissa, Brasiliassa, Indonesiassa, Uzbekistanissa, Azerbaijanissa, Perussa, Boliviassa. Hän on tehnyt esittävän säveltaiteen tohtorin tutkinnon kuuluisassa The Juilliard Schoolissa New Yorkissa, lopputyönään Musiikki ja Retoriikka Barokkimusiikissa. For a few years already she has been living in Peru and has been part of the not for profit cultural association ERART, offering concerts, workshops and teacher trainings. 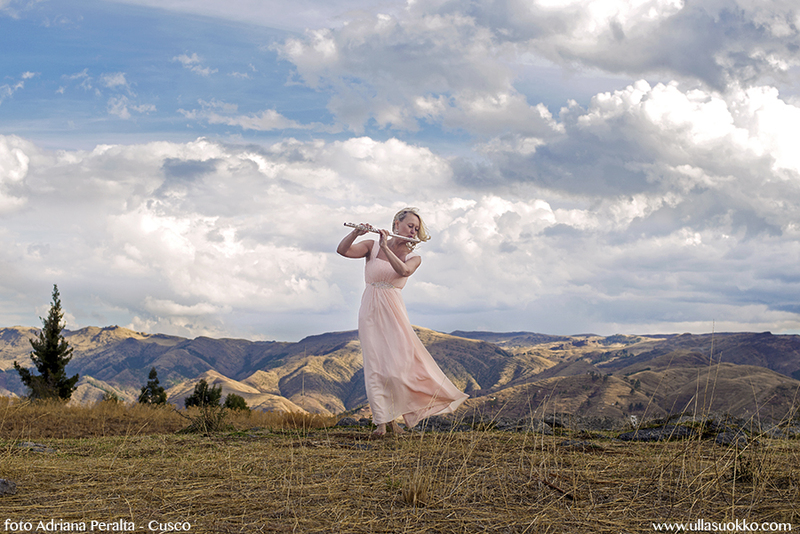 She has also performed in the most important concert halls of Lima, including Gran Teatro Nacional and the Teatro Municipal, and she has participated in many festivals such as, Contemporary Music Festival of Lima, Festival of Winds in Cusco, and Festival of Scenic Arts El Arte de Sol in Máncora. At the moment she is traveling giving concerts and workshops all over the world, and working with various organizations to create opportunities for music and arts education for children. She offers master classes for musicians and workshops of different kinds for personal transformation, success and happiness.